A very comfortable and big house. Clean, spacious and Airy. Yard. Nice area. Property 2: A very comfortable and big house. Clean, spacious and Airy. Yard. Nice area. Country BnB & Norwegian Spa. Property 7: Country BnB & Norwegian Spa. 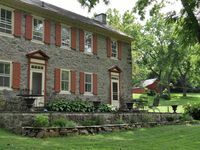 Property 10: Bucks County Summer Retreat! Luxury Dutch Colonial Log Farmhouse - Best in Bucks. Every Amenity Imaginable! Property 15: Luxury Dutch Colonial Log Farmhouse - Best in Bucks. Every Amenity Imaginable! Great place for an off site team meeting! The entire house is better than the pictures. I had a 10 person off-site team meeting and it was perfect! It allowed us to all work thru our agenda in a very relaxed atmosphere. Plenty of room for all. And the WIFI was great!